All Yermo homes currently listed for sale in Yermo as of 04/19/2019 are shown below. You can change the search criteria at any time by pressing the 'Change Search' button below. If you have any questions or you would like more information about any Yermo homes for sale or other Yermo real estate, please contact us and one of our knowledgeable Yermo REALTORS® would be pleased to assist you. "Beautiful lake front property. One of the largest lake frontage lots at Calico Lakes. Beautiful views of lake and sunsets you must see to believe. Swim, fish, water ski, paddle boat, paddle board, the skys the limit. Features of home 4 bedrooms, 2 baths, office, and a big surprise!! an indoor pool. This pool is great for after great day on the lake. Very easy care.The kitchen features built in double door dishwasher, in drawer ice maker, stove and refrigerator, micro wave and beautiful counter tops. The laundry room has a large washer and dryer that remains with home. The living room features a pellet stove that heats the entire home.This home is one of a kind. come and take a look. The yard features many fruit trees, and there is a raised vegetable garden on drip system that boasts lots of veggies each year. # of RV Spaces: 0 Special Features: ,SK,LAKE Lot Location Type: On Lake Special Features: Garage Door Opener, Underground Util: # of Attached Spaces: 2 # of Detached Spaces: 0"
"Beautiful custom lakefront property.This home has 4 bedrooms, 3 baths and so many extras you have to see!! The family room is 1800 sq. ft. and features a large gas burning fireplace with a custom TV above it and many builtin shelves. And next is a large custom indoor spa with so many features. It is a saltwater spa with lights, a safe mesh cover, multi color lights and many settings.In kitchen area of this room is an extra large granite covered island with seating for up to 15 people. Behind this is a large granite counter with 2 built in wine coolers,sub-zero refrigerator, two ovens, two warming overs, built in grill,and pot filler . This area has complete surround sound system. The entire back wall are automatic opening door, and windows, which open up this area to the fully landscaped rear fenced yard, with the view of the lake. It also has a boat dock. There is a second kitchen with granite counter tops, stove and pantry that flows into the formal dining room on one end and has a dining nook on the other end. The formal living area features a fireplace, built in shelves. The front of home is fully landscaped and fenced with a automatic gate. The garage is extra long to fit a boat. The area in front is fully concreted with plenty of room for RV, and parking for many cars. This home is a GEM! # of RV Spaces: 0 Special Features: BN,,TS,WSEC,SHLAKE Lot Location Type: On Lake Special Features: Garage Door Opener # of Attached Spaces: 2 # of Detached Spaces: 0"
"Calling all investors! Triplex located in Yermo close to the famous Eddie's World! Each unit offers one bedroom, one bathroom, living and dining area, tons of parking and just minutes away from the 15 freeway. This is perfect for someone looking for extra income! Association Amenities: None # of RV Spaces: 0NONE Frontage Type: Dirt Road Lot Location Type: Standard Location Special Features: None # of Attached Spaces: 0 # of Detached Spaces: 0"
"This property has no foundation. It's a house made out of blocks that needs a lot of work. It's residential and may be used for commercial. Located in front of the fire department and 5 minutes from the 15 freeway, located on Yermo road. There is water connection for the outside only (patio). No electricity connected but there used to be electricity. Does not have gas meter but all piping for gas connections are there. Selling in AS-IS CONDITION. 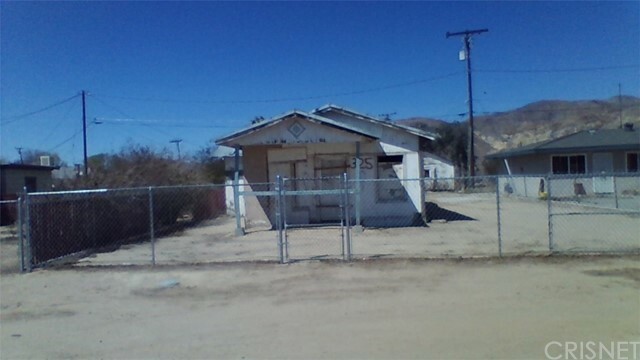 Close to Marine Corps Logistics Base Barstow, Yermo Annex and restaurant."